With its simple language and illustrations, Boo's Surprise by Betsy Byars is a great introduction to chapter books for beginning readers. It is the first such book that my three year old would sit through in its entirety, possibly because she could relate to the main character, and it doesn't hurt that there is a dinosaur in it. It is the sweet story of a little girl called Boo who finds (or imagines she finds) a dinosaur egg which hatches into a flying dinosaur who becomes her new best friend. It is nice to see a little girl character who runs around in a soccer uniform or her magic cape and is active outdoors. Boo's relationship with her brother Sammy is a lovely example of siblings getting on well together. The story could also be used to start a discussion with a child about how it is okay when friends move away. It could be read aloud by parents or by children who are becoming confident readers. I would recommend it for children aged 3 to 7. 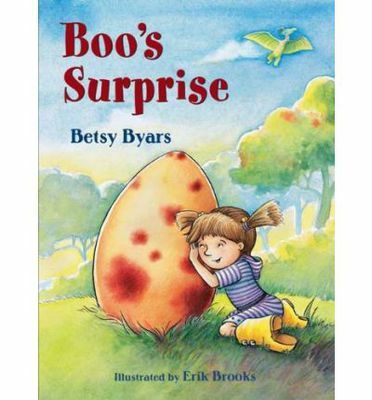 If you enjoyed this book you might also like Boo's Dinosaur by Betsy Byars.